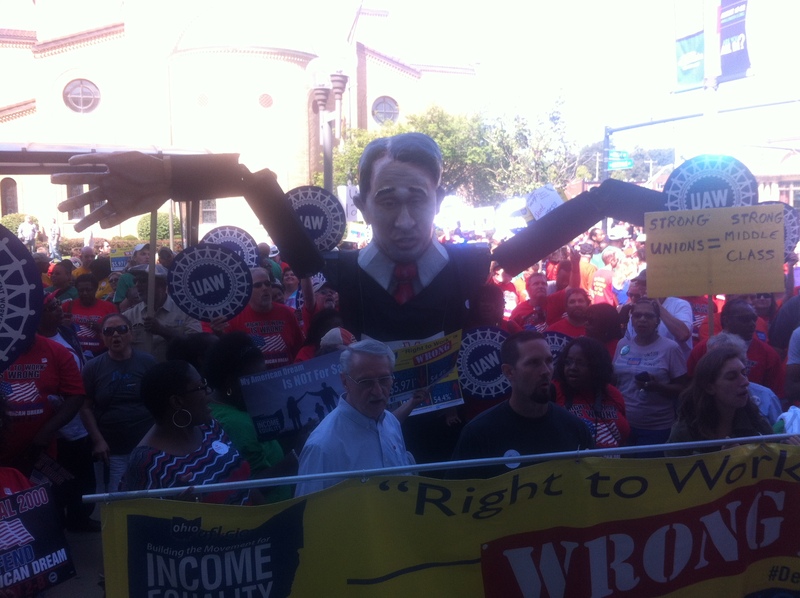 Over 3000 working people across Ohio and neighboring states descended on Columbus, Ohio to rally and march because corporate CEOs like the Billionaire Koch brothers have put out economy out of balance. Tagged the #DefendTheDream rally, average people assembled not to hear from politicians, but from everyday workers who understand the policies put forth by corporate front groups like Americans For Prosperity are trying to buy the American Dream one election at a time. Other speakers included Cleveland’s Artheta Peters, a home care worker and SEIU/1199 member, retired Urbana, Ohio teacher Mary Binegar, the Reverend Susan Smith of Columbus, Ohio State student Lainie Rini and UAW member Rick Ward of Kokomo, Indiana who was seen the fall out affects of a state adopting “Right To Work” Is Wrong policy. From McFerson Commons, the thousands of working people then marched the half-mile to the convention center where Americans For Prosperity was holding their annual Summit. With chants like. 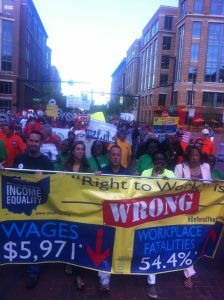 “Everywhere we go, Koch brothers want to know, who we are , so we tell them, We are the Workers, the mighty, mighty workers,” average Ohioans let extremists know that policies like “Right To Work” is Wrong, voter suppression and bad trade policies that drive down wages are not what average Americans want from their elected officials.